A tradition of southern gospel runs deep in bluegrass music, almost as deep as the traditional cowboy hats that many groups wear on stage. 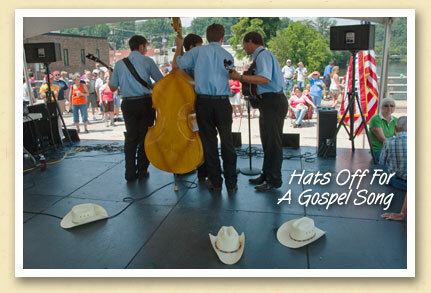 Except when it’s time to sing a gospel song, the hats generally come off — another tradition observed by the Rye Holler Boys at the Freedom Fest celebration last weekend. Ranging in age from 15 to 17, the Bryson City foursome has attracted a growing fan base. They’re scheduled to perform twice at the Saturday evening Music In The Mountains concerts at the Bryson City depot — August 7 and September 18. You can learn more about the free Music In The Mountains concerts here.